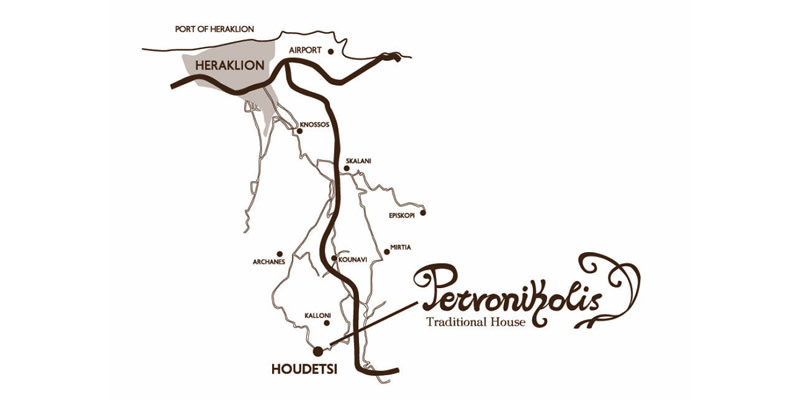 ACCESS TO HOUDETSI – Welcome to Traditional Guesthouse Petronikolis! In a distance of 20 km south from the airport and the port of Heraklion Crete and at altitude of 450 meters, you will find the village of Houdetsi which has up to 1100 inhabitants. It is a traditional village of continuous growth, unique natural beauty and buildings of traditional architecture. The name of the village according to venetian, Turkish and other documents, is mentioned for the first time in 1279 A.D. As we can see from the excavations and the findings, the settlement dates back to the Minoan period, or even before it. According to the tales of the elderly, the first lord of the village was Houndios, which gave its name. The legend mentions that he was a rich lord with despicable wealth. It is, of course, unknown when and from where Houndios established the village in this area. It is a fact however that we can, hypothetically, identify with every precaution, the reasons that lead him here. For sure, the first reason could be Flega spring, with its rich and fresh water. Therefore, the valley, next to the spring with nutritious land, could be cultivated easily. The mountain slopes with lush floar, could be the gazing ground for the lord’s sheep. As well as that the location between the hills was a controlled passage, could be one of the reasons that brought him here. Another version for the name Houdetsi, it is that originated from the combination of the words “hous” (ground) and awe (fear). A correlation that can be interpreted as anyone desires.